A lion blindsides a smaller buffalo as it emerges from bushes at the Mjejane Reserve in South Africa. 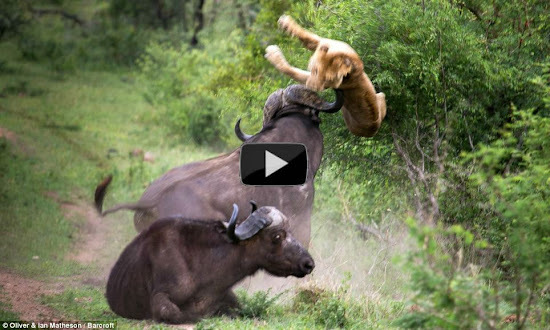 All looked lost when this young and lone buffalo was attacked by two lions in a South African national park. But the pair had not bargained on the buffalo's friends coming to his rescue, and moments later they were tossed several feet in the air before being chased away. The dramatic scene was captured on camera in the Mjejane Reserve on the border of the Kruger Park. It was witnessed by Oliver Matheson, 16, and his two friends Yaseen Majal, 17 and Alex Raubenheimer, 17. They had joined Oliver's father Ian, 52, on an early morning game drive and didn't expect to witness a 'kill', let alone a battle between a hungry lion and a buffalo that had other ideas. 'We had seen the two young lions on the prowl and were already quite excited to witness nature in action, but nothing could have prepared us for what we saw next', said Oliver. The two young lions had been silently stalking the buffalo for about 45 minutes before the incident occurred. In a flash they pounced and began to take down their prey. The buffalo put up a brave fight, but ultimately looked destined to succumb to the ruthless attack. 'It looked like it was game over, he really looked finished', said Oliver. 'Then we saw two of the original herd coming back to investigate and we didn't really know what to expect'. As the young buffalo fell to the ground, a large bull from the herd sized up the situation, seized his opportunity and attacked the young lion. 'It was insane, he flipped the lion about 5 metres into the air. I had never seen anything like it,' said Oliver. 'We visit the park two to three times a year,' said Oliver's father, Ian. 'In all the years we have been coming to the reserve, we have never seen anything close to what we saw that morning'. 'We really felt privileged to have witnessed such a rare occurrence'. Amazingly all of the animals walked away without any injuries, except perhaps, some bruised egos. #lion #blind #buffalo #Mjejane #Reserve #South #Africa.